The Best Ultralight Spinning Reel - Top Choices for 2019! Ultralight fishing can be an absolute blast since you are using the lightest, most sensitive fishing equipment available. Because of this, you feel every strike, every little nibble, and every piece of structure your lure hits. An Ultralight spinning reel basically differs from heavier duty fishing poles in that it allows you to cast small lures farther than any other set. You can cast crappie tubes, panfish lures, trout spinners, and other UL lures farther with ease if you have the right setup. Read past the reviews if you want some tips on the best line for an ultralight spinning reel. Now, lets start our search for the best ultralight spinning reel. This is from the springiness of the rod and the smaller design of the reel that work together to act as a “spring”, similar to a fly rod, to push a UL lure further. With a standard combo that is stiffer, you would never get the lure more than ten feet away. That’s why it’s imperative to get the best ultralight spinning equipment, and especially the best ultralight spinning reel you can possibly get. Here are some great suggestions for the top five UL spinning reels on the market. The Pflueger President is perhaps one of the most popular and well known spinning reels on the market, and many will tell you it’s among the best for your money. Their ultralight version of this reel is no different, being the top ultralight spinning reel. This reel will perform with smoothness due to the 7 ball bearings that drive this reel. 7 ball bearings in an ultralight reel is a very high number, and it’s one you’ll come to appreciate if you get this reel. Most of the other reels shown on this page will have quite a bit less than that. Ball bearings really control how smooth a reel is during retrieval. This UL spinning reel is also made primarily of metal, so it’ll outlast any competition you’ll look at. If you’re looking for a good ultralight spinning reel, this is your best bet. It’s one of the best reels for trout, crappie, panfish, and you can also upsize it to go after bigger species. Here are some pros and cons about it. If you have any doubts about this reel, go read the reviews on Amazon. Reviewers agree with us, saying it’s the top ultralight reel they’ve ever used due to smoothness and durability. If you do decide to buy this one, make sure you select the “4 lb/ 100 yard” option as the ultralight unless you need bigger. 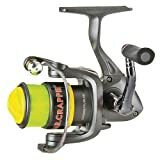 Another great reel for small fish like panfish, sunfish, crappies, trout, and more, the Daiwa Sweepfire is also a fairly smooth reel at a decent price. This reel is durable and made primarily of metal as well. It has a comfortable, non-slip handle and a good drag system. The bail works to eliminate line twist, which is actually a factor for ultralight fishing. If your line twists and you cast a light lure out, the twist in the line is often enough to make your lure perform inefficiently. While this reel only has 2 ball bearings, reviewers still say it’s a very smooth reel. Here are some pros and cons of the Daiwa Sweepfire reel. This reel is a solid ultralight fishing reel that’ll last you for a few years. Check it out on Amazon and read what other reviewers have to say. Looking for a reel that’s specifically designed only for panfish, more specifically crappie? That was the intent of the reel, designed by a world famous crappie fisher named Wally Marshall. The design of this is ideal for shooting small tubes under docks, into reeds, and more. Everything is made out of lightweight graphite, so it should last for awhile. It also comes pre-spooled with line, albeit pretty worthless line. However, if you are just looking for a great starter set ready to fish out of the box, this is it. This reel makes a great starter crappie fishing reel for those interested. It is a very cheap starter reel to get and see if ultralight fishing is your thing. Feel free to head over and read more reviews at Amazon. Last but not least is the Daiwa D-Spin Ultralight Spinning Reel. 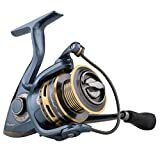 This reel is the cheapest out of the five UL spinning reels shown here, and would make a great starter reel for anyone wanting to try out ultralight fishing. The housing is all made out of plastic composite, so you must be careful with it. It also has only one ball bearing and doesn’t have full anti-reverse, which may be important depending on what you’re planning on using it for. If you’re just looking for the cheapest ultralight spinning reel you can find, this is it. While it may not be the most durable or highest quality, this reel will simply get you out on the water fishing for panfish for the lowest price. Monofilament is a single strand of plastic that is pulled and stretched until it reaches a certain diameter. Normally, the material it is made of is stretchy and floats, as well as invisible. Fluorocarbon is also a single strand, but of fluorocarbon, and it’s not so stretchy and it sinks or suspends. It’s more sensitive and totally invisible. Lastly, braided line is not stretchy, and normally it sinks. It’s the only one of these three that’s not invisible at all. Now, the question is which of the best works best for most ultralight applications? Mono would be pretty solid, but it floats, so it might hold light lures higher up in the water column or slow down their sink rate so much you could wait all day. It also is stretchy and thus doesn’t transfer light taps like those from crappie and trout very well. Braid would be better if it were invisible, since many of the fish that ultralight are designed to chase are finicky, like trout or crappie. It’s sensitive. You can feel the light tap from any of the above fish much better than monofilament. It’s invisible. Any of the above fish could be fussy eaters in the right conditions, so you may as well tip the odds a little more in your favor. It sinks. This is especially important with ultralight lures that can sink slowly – this can really help your lures get down to where you want them quickly. Hopefully by now you can see the logical reasoning used to arrive at the conclusion that fluorocarbon line is superior for ultralight fisherman. Not all fluorocarbon line is created equally, though! Differences in the manufacturing process and the materials used will create lesser lines if you aren’t selective. Our recommendation will always be [easyazon_link identifier=”B000EE3ILA” locale=”US” tag=”getfishingequipment-20″]Seaguar InvizX[/easyazon_link] – low memory, high sensitivity fluorocarbon line. It’s what we use and always will use. Check it out and see what you think! Depending on what you’re looking for in an ultralight reel, you can take your pick of any of the above and it would be a good choice. However, the top quality and best for your money pick is the ultralight Pflueger President spinning reel. Check that reel out, read the reviews, buy it, and you won’t be disappointed. If you want a bigger reel, check out the best spinning reels under 150 bucks!